I am undertaking a continuing project of the construction and implementation of unmanned aircraft systems (UAS) that are experiment specific. These projects consist of engineering and implementing specific aircraft for varying situations that are expected by a particular client. After construction of these unmanned aerial vehicles (UAVs), it is my responsibility to deliver the UAVs to the customer and decipher any mechanical problems that may exist during experimentation. 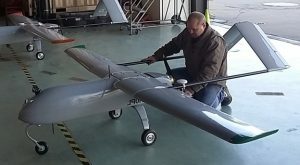 Some contracts have required customized payloads to be incorporated into the UAVs (e.g. dual UAVs flying in tandem) to classify tasks for a specific study. The maintenance and integration of the aircraft is a continuous and tailored process, dependent upon each experiment or contractual obligation. In the technologically dynamic world of UAS, it is evident more research will unlock the untapped potential of these systems, ranging from basic transportation needs to military applications. My field of study is Mechanical Engineering at the University of Iowa with a tailored elective focus area (EFA) to further develop my skills in the advancement of prospective unmanned aircraft practices.